to design specification limits under those same high load/high RPM conditions; and, substantially expand the overall capacity of the cooling system. In doing so, we will discover a host of benefits that can be realized only by directly cooling your oil. Fact: As we saw in Part One of Direct Oil Cooling, GM has chosen to design and implement an indirect oil-cooling system for the Duramax engine. One result – other than living with scorching oil temperatures – of this OEM system that is not able to keep oil temperature under control during times of high combined work loads and high RPM is a host of after market solutions that promise to atone for the cooling system’s shortcoming. Unfortunately, many of them simply attempt to beef up the existing system with a bigger radiator or another fan instead of providing a solution based on a sound engineering approach that does not create undue burden on the overall system. That is, they continue to try, piggyback style, to cool the oil indirectly. 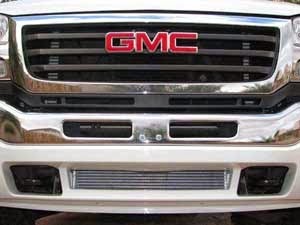 While these would-be solutions may succeed in reducing oil temperature, for example, from 360ºF to (only) 330ºF, they do so at a great burden to the Duramax electrical system as well as taking a toll on precious fuel economy. The ability to directly control oil within specified limits comes at a co$t generally considered unacceptable by auto manufacturers. When GM produced its second generation Corvette, for example, it chose to factory-fill the known 280ºF lubrication system with synthetic oil. This decision was NOT based on a ploy to entice enthusiasts – a great marketing tool – but because, looking at the bottom line, GM decided it was smarter to spend $5 on more tolerant oil than to provide the sports car with a more robust oil cooling system. They even had the foresight to market this decision as a high-performance, no-compromise benefit of buying the car. Now, I am an engineer and not an accountant and so I do not know – or want to know – all the data that go into the decisions of what gets included and what gets tossed when designing and building my truck; but, what is good for stock dividends is not necessarily good for my engine’s oil – or, in the long run, for the engine itself. Rather than the direct oil cooling system on the Duramax that I would have liked to see, we find the DMax coolant-to-oil heat exchanger that was introduced in Part One. It places the burden of cooling the oil on the radiator fluid (that I’ll refer to as “water” for the rest of this article.) The water, tasked with cooling the engine, must also cool the oil that, as we have already mentioned, can exceed 360ºF – under stress conditions – when using the indirect cooling method. This someone then concludes for you that water is obviously a superior cooling agent than oil; and therefore, increasing the capacity of the existing, indirect cooling system is, of course, the way to go. This “salesman” will likely follow up that seemingly inarguable fact by quoting the flow rate advantages of water over oil to further build your trust. To show the shallow logic employed in the above statements that argue in favor of the indirect cooling method will take some time: first, I will address the statement that water is a superior cooling agent and then we will compare “flow rate advantages” and what they actually mean inside our DMax engine. In the world of heat exchange, it is common knowledge that a pound of water holds 40% more heat than a pound of oil. This is important because the more heat a substance can hold, the greater potential it possesses as a coolant that is able to carry away heat from the engine. Theoretically, a pound of water can, when circulated through my engine, remove a full BTU of heat; a pound of oil, on the other hand, only removes 0.6 BTU. The truth is, while water, theoretically, is the best cooling agent found under the hood of your truck, it just doesn’t matter. There are at least two straightforward reasons for this: the first is that there is a limit to the amount of heat that can be dissipated through any radiator, stock or aftermarket – or combination of radiators – for that matter. The second reason hinges on water’s responsibility, in stock configuration, to also remove the heat from the oil – something it does with relative inefficiency and limited effectiveness. This formula applies to every radiator, oil cooler, fuel cooler; basically, all heat exchange systems. It describes the heat energy exchange or the amount of heat transferred (Q) between two media (in our case air and either water or oil) as being equal to the flow rate (M) of the coolant times the heat capacity (Cp) of the coolant (a constant that is specific to each type of medium) times the temperature change (deltaT) of the coolant. With this last equation we can see that if the air is indeed limited (which it always is) then its ability to cool the coolant is limited as well. In case I have lost you with these equations, what this means for us is that the ability of the coolant, whether water or oil, to pull heat away from the engine and transfer it to the air is limited by the amount and temperature quality of air that we can get to the coolant. This brings us back to the truck shop and the claims of those who promote the superior cooling power of water when compared to air. Oil, having a heat capacity of 0.5 BTU per pound per degree Fahrenheit, has only two-thirds the effectiveness of water (50/50) that enjoys a heat capacity of 0.8 BTU per pound per degree Fahrenheit. While this may sound impressive in favor of the water, it ends up being totally irrelevant. Why? Because air trails both of these media with a capacity of only 0.25 BTU per pound per degree Fahrenheit. That’s right, air, the medium that both water and oil ultimately depend upon to be cooled, turns out to be the limiting agent. Air has only 0.25 BTU per pound per degree Fahrenheit for heat capacity and a pound of air is a LOT of air. Air, with its inferior heat carrying capacity, limits heat transfer in the case of both water or oil because it is always in short supply. You need a house size parcel of air to equal the heat carrying capacity of a few gallons of hot dense liquid. Getting enough air through the fins of the air-to-liquid heat exchanger is always the biggest challenge and always ends up limiting the cooling ability of the liquid coolant as it courses through your motor. In short, air, as the limiting agent, nullifies any advantage that water’s superior heat capacity would enjoy compared to oil. This explains the first reason why water, in the real world of your Duramax engine, is at no advantage to oil when it comes to heat capacity. The second reason, as I stated earlier, is that on top of pulling heat away from the engine, water must, in stock configuration, also pull heat away from the oil. Said another way, any heat that is exchanged from the oil must be exchanged into the water. Any heat that the water is unable to receive (and remember the water cannot be allowed to reach boiling point) is conserved in the oil in First Law Thermodynamic fashion. This conservation manifests itself in constantly rising oil temperature, rising at a higher rate than the directly cooled water. It accumulates stored thermal energy each cycle, until the workload is removed. Add an oil temperature gauge; it will change the way you look at cooling. Mash the pedal up a hill with a heavy load, and oil rises at the rate of 30ºF per minute, while oil pressure falls in response. So if you were to plot oil temp and water temperature on the same chart, you would see that oil stays warmer than water, as they rise together. Oil’s temperature always leads that of the water by 30 to 50ºF or more when under big load. As can be seen in the chart below (seen in Part One – shows a constant 175 HP engine load), oil is pulling up coolant, inside the stock oil-coolant heat exchanger, located inside the oil filter housing. These numbers reveal the efficiency problem of indirect oil cooling. Considering that the radiator typically is only good for about a 15ºF drop in water temperature (mainly because of limited airflow and deteriorated ITD), you can see that oil is adding to the radiator’s workload, in a sense, diminishing “headroom” needed to maintain a steady-state 210ºF ECT. If the radiator didn’t have to reject the oil’s heat load, it would operate more effectively. Before I get into why simply increasing water’s cooling capacity with a larger or auxiliary radiator is not a good idea, we need to talk about Inlet Temperature Difference or ITD. This is what heat energy exchange between air and the selected coolant is all about: that is, the difference in temperature between the air and the coolant. With respect to heat transfer, it is the driving force behind heat exchange, analogous to pressure in your garden hose or voltage in your house circuits. If the change in temperature (deltaT) is zero then heat exchange (Q) is zero. This is common sense: if I run 100ºF air over a 200ºF liquid, I would expect to remove more heat from the liquid – all else being equal – than if the air temperature was 150ºF. If the air was 200ºF, the same temperature as the liquid, then I would not expect to remove any heat from the liquid. The maximum theoretical change in temperature (deltaT) is this difference in temperature between the air and the coolant. On a 100ºF day, ambient air passes over the AC Condenser and the Intercooler first and is heated to 164ºF before it sees the radiator. So for the purpose of heat exchange, this air’s effectiveness is somewhat reduced because of its increased temperature. Put another way, the air’s all-important ITD has suffered a 64ºF deterioration before it ever reaches the radiator. So, using 164ºF air, let’s compare the difference in potential ITD between water and oil. Or, a near threefold difference in the heat exchange driving force in favor of the oil. Knowing that air is the limiting agent in cooling the engine, we can better understand the significance of ITD. The fact that there is nearly a threefold temperature advantage on the side of oil should clue us in to the fact that cooling the oil directly with air will give us better results. And, with the right oil cooler placed in its own airspace, we will also increase the amount of the limited air that is available to us. The superior heat carrying capacity (Cp) of water over oil really does not factor in here – because we don’t have unlimited air flow – and the air to which the radiator does have access is already saturated with heat. In the case of water coolant, the theoretical highest we will see air get is 220ºF, because that is the highest temp coolant we can allow. With oil that is 320ºF, the air can get to 320ºF theoretical. Since airflow, limited as it is, reaches a higher temperature (deltaT) with hot 320ºF oil versus 220ºF water, that deltaT difference alone is the determining factor for all AIR cooled heat exchangers. Hopefully, this helps us understand why a larger or auxiliary radiator is not the most effective solution to lowering oil temperatures. If it is an objective to control oil temperatures, then sticking with the indirect oil cooling method (by adding or upgrading a radiator) will definitely not accomplish your goal. You can bring oil temperatures down a bit that way, but all the water capacity in the world won’t change the reality of 80% efficiency in the oil-to-water cooler. The remaining 20% has no choice but to manifest itself in higher oil temperatures shown in the chart on the preceding page. It cannot be eliminated. Do you really want another radiator that is regulated to 200ºF to try to cool oil to that temperature when you have an abundance of 100ºF air available? …we have known for more than 20 years, that there is a relationship between the oil sump and engine coolant temperature. 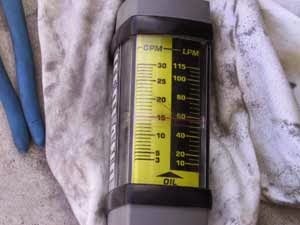 The relationship: when the coolant temperature decreases the oil sump decreases almost by the same value. In other words, if I succeed in dropping my water temperature 30ºF then I will bring my oil temperature down only 30ºF as well: a small consolation to 360ºF oil. A bigger problem for oil temperature in stock configuration is that the water is controlled to a temperature that serves the water, not the oil. Water must be kept below its boiling point of 260ºF (under pressure) or very bad things happen; so, it is controlled between 180 to 220ºF for the purpose of motor efficiency. Oil, in the stock configuration, has no hardware thermal controls. The water thermostats do not know or care what the oil temperature is: that is the problem and it is not going to change by making a better radiator. Since the radiator is served by a centrifugal pump and so is very sensitive to plumbing restriction, adding to the plumbing slows down water flow. Here is a little-known secret: without enormous expenditure, the only way to make the radiator more effective is to increase water flow rate. Putting a thicker radiator in an already air-challenged location, just adds to the air shortage dilemma with more fin depth. With our new understanding of heat transfer, it should be clear that a higher flowing water pump (or lower plumbing resistance) will have the net effect of increasing the average temperature change (deltaT) between water and air, thereby increasing the heat exchanged (Q). This is how you make water cooling more effective. If you have ever subscribed to the much-maligned belief that decreasing water flow rate allows water to spend more time getting cooled in the radiator, consider that for every minute the lower flow pump circulates in a slower flowing system, the water molecule spends exactly the same amount of time in the radiator, because the slower moving molecule makes less frequent trips through it. As a result of the slower speed, the average temperature change is lower, decreasing the amount of heat exchanged. The less is more thinking simply does not work in this application. So be aware of fantastic sounding claims of doubling cooling system rejection ability. That would require a minimum 100% increase in airflow. The next time you stick your head out the window running 70 MPH and inflate your lungs, remember the fans you have seen and what they do. Also, beware that you should never have to add multiple fans, to eliminate the noise of one. It’s a cover up for poor design considerations, to the detriment of the electrical system. Stressed alternators fail prematurely in today’s high heat environments due to electrical overload conditions. 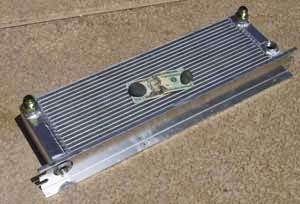 Just 2,500 CFM from an electric fan requires 50 amps in this atypical resistive cooling stack, a multifunction cooling fin sandwich that is eight inches thick. You are never told by the electric fan manufacturer that the flow rates they have quoted are measured in zero resistance test platforms. If you have a fan that is suppose to pull 3,000 CFM with 18 amps, trust me, when integrated and shrouded in front of the heat exchanger, you will be lucky to get 1,200 CFM with a 20 amp draw. This reality in fluid flow is the single biggest reason that designers using electric fans, fail to meet intended targets. A 50 amp add-on, in a system with just 100 amps (a typical 145 amp alternator) to run the entire vehicle, this is a poor idea, unless planning an expensive electrical system upgrade. This fact should not be overlooked, even if you intend to use the fan on an intermittent basis. A remotely-mounted, fanned radiator “improvement” is not a well-thought out solution to a relatively simple science problem. Airflow is the only shortage and a fan is a poor approach when you have a moving vehicle with all kinds of 70 MPH kinetic energy to tap. GM admittedly did not take advantage of this airflow like they could have but that doesn’t have to stop us from doing so. The only time an electrical fan should be considered as a solution for increasing airflow on a moving vehicle is, well, never. We already have the highest flowing fan in the industry. It moves twice the air of the highest powered electrical fan available. In fact, it is virtually impossible to formulate an electrical fan that even comes close because the motor would need to be as large as… a Duramax. We have a 300 HP motor that drives our fan. An oil flow meter (above) and an interface plate (below) are used to measure the flow rate of the oil in a DMax. OK, that ends our comparison of oil and water heat capacity. We have seen that while water has a higher theoretical heat capacity than oil, it does not matter for our purposes because of oil’s greater Inlet Temperature Difference that, combined with air’s limiting ability to remove heat, makes directly cooling your oil a superior means of controlling oil temperature. 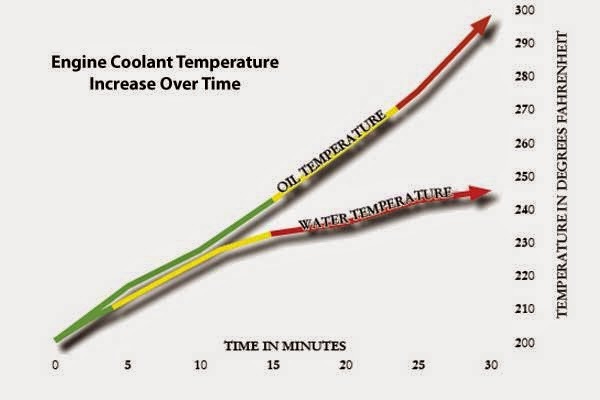 then the coolant, water or oil, with a higher flow rate will have an advantage in terms of cooling ability; that is, increasing flow rate (M) will increase the amount of heat exchange (Q). oil-to-air heat exchange, thermostatic temperature and flow controls. Oil, in this motor and some others, can transport 30-50% of the motors heat load. Also, your motor is much happier if it and the oil are at 200ºF not 300ºF. Oil is no longer much of a lubricant at 350ºF, (though it evaporates very nicely at this temperature) with only slightly more viscosity than water. So regulating oil temperature to 200ºF has the unique benefit of a motor that is creating, in fact, less friction heat. To compare the flow rate of water and oil, here is what I come up with using a flow meter designed for this task along with an oil interface plate. At idle speed, oil flows at 20% (3.5 GPM) of its high RPM flow rate (16 GPM); water, on the other hand, flows at 40% (25 GPM) of its high RPM flow rate (65 GPM). The explanation for water’s relatively low increase in flow at higher RPM is found in plumbing system design. 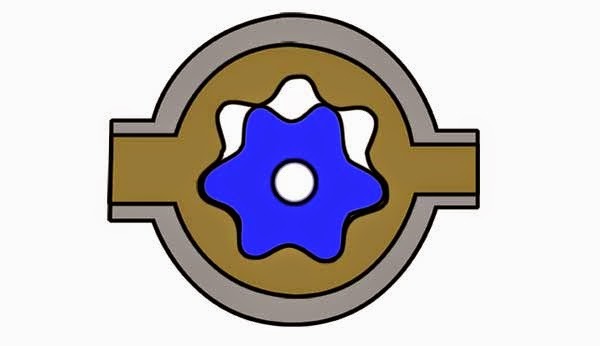 The water pump is a centrifugal design, referred to by designers as a constant pressure pump. With its associated plumbing, it has little ability to overcome inherent plumbing resistance. If you block a water hose, the pump will not care; it will just keep on spinning like nothing happened. The pressure at the blockage will only be as high as the pump vane design, which is designed low for system protection. It “pushes” with a constant force and that force or head has little to do with water flow rate if you dead-head it, by blocking the output. Hence the term constant head pump. The oil pump, conversely, is known as a constant displacement or constant volume type gear pump. It moves oil, with great force and lower volume than the water pump. The mini-Sherman of the pump world, it is capable of several hundred PSI system pressure if left unprotected. The plumbing design of the lube system is protected by a number of bypasses because of this ability to overcome resistance. Without these bypasses, the lubrication system would easily over pressurize on cold mornings. It also appears that on the GM turbo diesel vehicle that the oil pump cycles one revolution for every two engine RPM, or a gear reduction thereabouts. With this arrangement, it cycles oil in a wide range of flow rates that is highly RPM-dependent, from three to as much as 16 GPM – up to five times its idle flow rate. Water, on the other hand, can only run at 2.5 times its idle flow at higher engine RPM. Even a constant displacement pump can suffer flow reduction. The DMax pump will flow at 16 GPM, but only 14 GPM if the oil gets overheated, a 15% flow reduction. 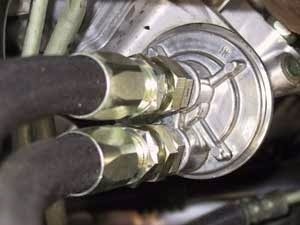 This reduction occurs as the workload increases and oil gets hotter and thinner; as a result of this thinning, more of the oil leaks by the intended gear path and re-circulates internally, resulting in reduced oil flow to the motor – just when you needed it to be doing its cooling job more than ever. Not only is the lower flow of overheated oil cooling less, but the lower viscosity is allowing metal-to-metal surfaces to get closer together, as the oil’s hydrodynamic film layer gets thinner. The abrasive contaminants in the oil will increasingly wear motor parts as more and more of these particles – while under the filter’s micron radar – become larger than the film’s deteriorated thickness. The result is accelerated wear according to the science of lubrication. When the oil pump was designed, it was optimized for a specific viscosity in conjunction with oil film thickness and lubrication needs; this is the manufacturer’s recommended viscosity rating for the oil you put in the vehicle. Below or above this viscosity, the oil flow rate is less than optimum. Note that 210ºF is the optimal temperature for a typical 15W-40 diesel oil. This is not a coincidence. That is the typical low-load oil temperature of this truck on a 90ºF day and the temperature that most motor builders specify for peak lubricity. The high limit is normally specified at approximately 260ºF. So we might ask ourselves, what good are manufacturers recommendations if the oil temperature in my truck renders them meaningless? Let’s get back to the oil pump and resistance to flow. The oil pressure gauge displays resistance to flow: typically 45 to 90 PSI at 2,000 RPM, depending on temperature. Contrast that to the water pump, which, while a 120 GPM pump (when it encounters no plumbing resistance), operates at only 60 GPM at 2,000 RPM due to the plumbing limited constant head design. While it may be true that oil at full throttle (16 GPM) can still flow only a little over half the rate of water at idle (25 GPM), we now see that oil heat transfer becomes proportionately more effective at higher RPM compared to water: its flow rate of change rising at 250% that of water. It does NOT, of course, flow more volume than the water pump, and it never will. The difference is that the oil cools in places that pressurized water is not allowed to go. It bathes every square inch of the motor’s moving parts, hot by virtue of conduction. Another advantage of oil’s paling flow rate is that it allows the oil more residence time for heat exchange. Oil temperature rise in the motor can be as much as 45ºF before it emerges to be cooled, compared to water’s 15ºF typical rise. What does all this say? At overheat workloads; oil can carry 30-50% of the motor’s conduction heat product, leaving water responsible for the remainder. At 12 GPM on a 90ºF day, thermostatic protection was set to 180ºF for this test. Yellow is the bulk oil temperature coming out of the motor. Blue represents the oil temperature after the cooler, single pass (less than two seconds residence time). At 70 MPH, this is a 40ºF reduction; or, around 60,000 BTU per hour. Red and green represent the ambient air temp increase, front to back, across the width of the EOC. Hopefully, we can now see that Direct Oil Cooling is the only way to control oil temperature and, by doing so, control viscosity and optimum flow rate. Direct Oil Cooling also has the advantage of increasing the overall capacity of your cooling system. When done right, this can mean a 20% increase (120,000 BTU per hour) in your DMax engine’s ability to get rid of the heat it creates. Unable to find the “right fit” oil cooler for my Duramax, I ended up designing one myself. 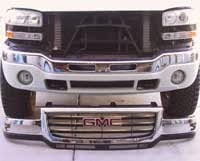 It is a fully air-dammed turbo-diesel engine oil cooler (TD-EOC) custom sized and built for the Duramax. It is necessarily large, two to four times the capacity of typical mass produced EOCs due to the shear increase in oil flow rates and cooling needs of modern turbo-diesels. It sheds oil heat before the oil-to-water heat exchanger; that is, before the heat in the oil has a chance to heat up the water. It adds over 120,000 BTU per hour to the heavy duty cooling system when coupled with the air dam. That represents a 20% cooling system capacity increase. The typical off-the-shelf EOC, installed behind the grill, can only yield 10,000 to 20,000 BTU per hour of added heat removal, and is not worth your effort. 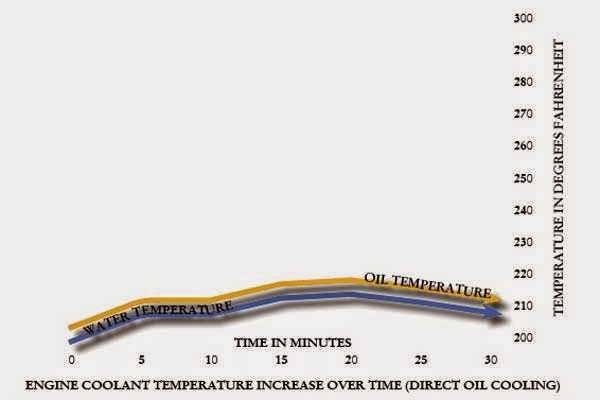 Unlike the chart on page 40 that shows oil temperatures when the stock Indirect Oil Cooling method is used, the directly cooled oil stays controlled as we see in the chart on the bottom of page 47. If you add enough direct oil-to-air cooling, you can even reverse the OEM cooler heat exchange, using oil to actually cool the water, the radiator’s normal task. The oversized EOC does this effectively 90% of the time, taking heat away from the fan and motor bay area. Sounds great, but this can actually be detrimental if too much heat is removed; it makes obvious the importance of thermostat control to keep the oil from over cooling the motor. This EOC is located in its own air parcel, beneath the radiator stack, a key detail that improves the coveted air flow rate, and unburdens the already heat soaked radiator cooling stack. It is clear that the energy that is removed from the oil, to make it cooler, is transferred to the air, making it hotter, as we have learned. This is no-load (empty). As the workload goes up, oil also heats up beyond 180ºF, up to 260ºF (down from 360ºF) in a truly abusive extended cycle; and, heat rejection will increase further to 121,000 BTU per hour on a hot 100ºF; 140,000 BTU per hour on an 80ºF day. Do you see the benefit of having hot oil when it comes to getting rid of heat? All done without a single electrical part! 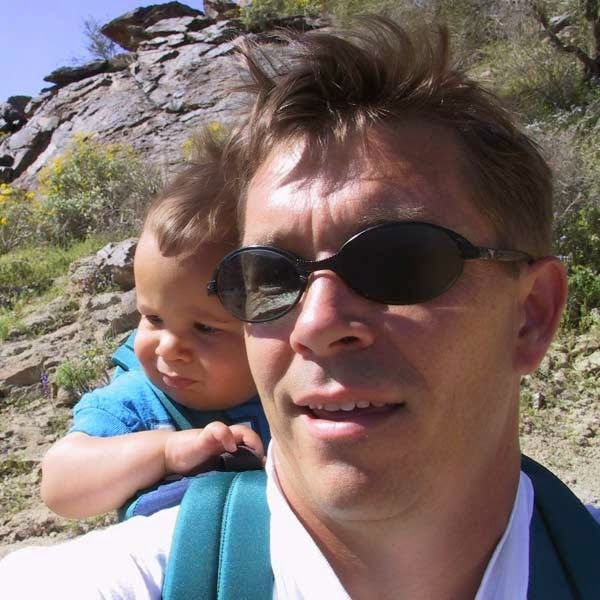 Lower oil temperatures, load dependent, as much as 100ºF lower. Prevents viscosity induced, oil pressure decay. Improved under piston cooling performance- increased piston life. Reduction/Elimination of fan occurrence-increases MPG. Increases duty cycle of vehicles, allows heavier workload conditions. Observed 15ºF transmission temp reduction. Longer life for all lubricated components, turbo longevity. Reduced oil consumption and evaporation thickening. Simple, and reliable, no moving parts, fans or relays. System Capacity Expansion, Equals more additive protection. Thermostatic control of oil temperature-will not run cold or over cool the motor. Temp control permits use of less expensive non-synthetic oils if desired. Longer oil change intervals, temperature sensitive additives last longer. All converge on one thing. For the working truck, you will extend the life of the motor appreciably. This should offset the only disadvantage of using one: exposing oil to road risks. Loss of oil should always be considered. A rapid loss of capacity can quickly result in serious motor damage. About the only way for this to happen is to hit something, as today’s lines are built to aircraft reliability standards. A slow leak will not harm anything as long as the shutdown occurs when the low oil quantity message appears. In over a million miles of road use, I have not heard of a single occurrence of either. But again, it must be considered a disadvantage to expose oil to the risks of transport outside the motor. For me, the benefit of possibly doubling time before overhaul, makes it worth the risk. No electric fans are added to accomplish these benefits: the essence of a solid approach, minimalism. The electrical system will not be burdened with unnecessary loads, eliminating added electrical system stress and overload. Most shelf oil coolers use AN-10 lines and fittings. That would harm the turbo-diesels motor, restricting the high oil flow rate. 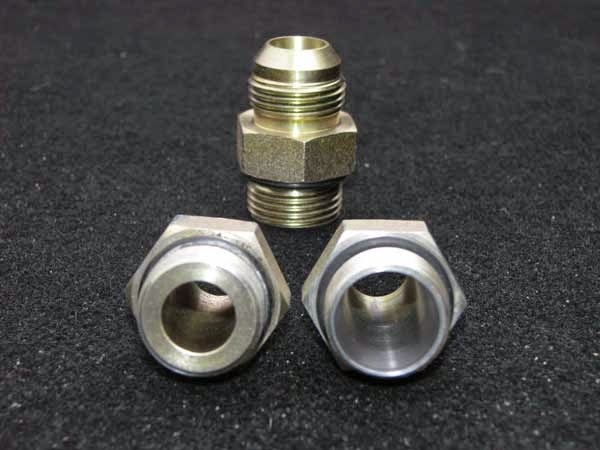 The TD-EOC not only uses AN-12 but all fittings are custom drilled and tapered for the least possible restriction and highest possible flow rate. One final word, and the most important caution you will get. Unless you know exactly what you are doing, do not brew your own recipe for oil cooling. When the motor cooks due to oil restriction, it is difficult to prove. NEVER buy oil cooling according to some stores recommended “HP rating” marketing gimmick. It has nothing to do with oil flow rates or heat exchange. The hack companies that sell this junk are aware of this, and will not come to your aid. Oil is the life-blood of your HD or LD motor and its high flow rates require special consideration not available “off-the-shelf”. Typical EOCs and line sets are built for much lower flow rates and restrict oil flow rate horribly at higher RPM. Additionally, there are cold weather considerations that make this a very dangerous modification when done on the cheap. You will eventually regret the decision. This is not a design project for the engineer wannabe.